It’s time to recognize the glorious signs of spring. Everyone is talking about the record breaking warm temperatures and early spring of 1212. The crocuses were blooming in March, and so are the daffodils and forsythia. Cherry trees are swollen with new buds and the maples are leafing out. But nobody has mentioned the Koi. Koi are a species of fish originating in Japan and known for their beautiful colors, graceful movement, and impressive size. Koi ponds are becoming popular as highlights of home gardens; they add a fascination for living creatures to the plant world. Our Koi Pond “came with the house.” We didn’t install it: the former owners of our house did. Therefore we inherited a Koi Pond. In winter the Koi’s metabolism slows down and they go into hibernation, much as bears do. They need no food during those cold months. Only when the temperatures creep back up to 50 degrees can they resume their normal feeding schedule. Early in the spring, when the temperatures fluctuate so wildly, they start the season with light snacks. Surprisingly, a favorite choice for beginning the feeding is Honey Nut Cheerios. Imagine children of Koi hobbyists wrestling with the Koi for their Honey Nut Cereal. If General Mills knew about this extra use for their product they could launch a new advertising campaign aimed at fish hobbyists. The Koi zoom to the edge of the pond to get their first season’s taste of their favorite cereal to get them eating again after their long winter of hibernation. From Honey Nut Cheerios they graduate to regular Cheerios, then on to wheat germ pellets, which accelerate the digestive process. 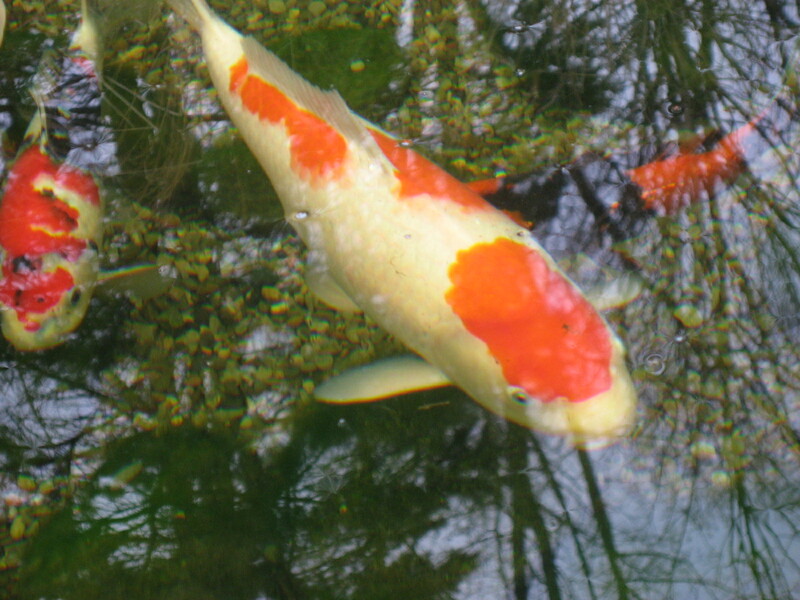 Then comes the big day: the Koi finally get to eat their normal diet of Growth Pellets: a blend of protein, fats and fibers laced with dried seaweed, soybean and vitamins. Their feeding schedule increases up to four times a day. Their growth rivals that of thriving summer flowers. But all is not perfect in the peaceful Koi pond. A dangerous creature lurks overhead, longing for a tasty meal. The Heron. Herons fly overhead searching for a substantial feast. They do not swoop down from the air and catch a fish, as a pelican would. They land nearby and walk to the pond, seeking entry to their quest. That is why ponds are built with steep rock walls; if the access to the pond were easy to walk to and wade into, the Koi would suffer large losses. To protect them from heron attacks we installed a motion detector called “The Scarecrow.” Every time anything approaches the pond a noisy, powerful spray of water turns on, frightening living creatures from getting too close. 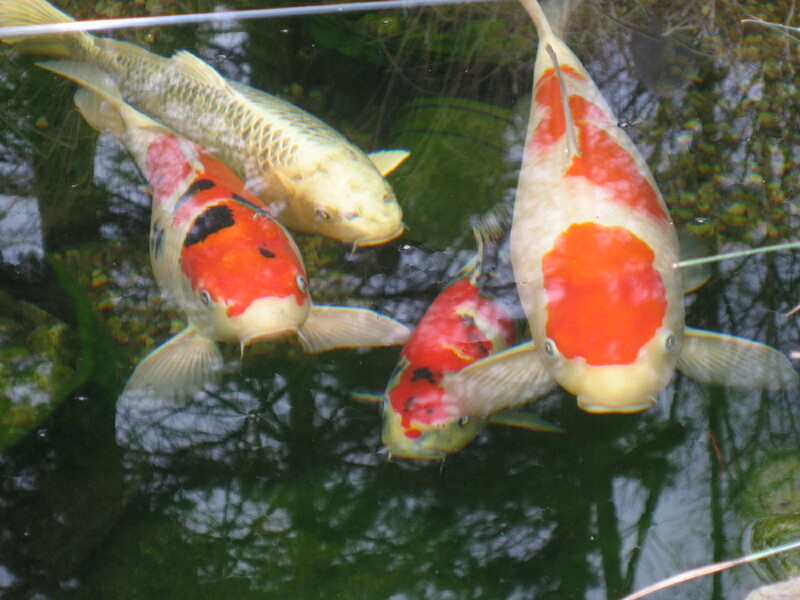 The Koi become quite tame, and swim to the edge of the pond when they sense a human bearing food pellets. Welcome, summer, and welcome to our Koi Pond. Oh I bet you really get attached to the little guys. And how interesting that they go into hibernation in the winter. They really are the perfect pets! I know that if I were in hibernation all winter I’d certainly come running for some Honey Nut Cherios too! Fascinating post Ronnie!! Love the pictures too! Yes, they are beautiful. Perhaps you can do a moving graphic about them. It’s the best time of all! Thanks, and I wish you a happy spring too. Love koi! And envy you your koi pond. And you know, there are things that might be different here in Hawaii, such as no herons except at high-end resorts. Still, keeping these lovely creatures doubtless requires some preparation and knowledge. Glad you are such a good caregiver, for they are beautiful to behold. Who gets the toy surprise in the cereal box — you or the fish? They’re beautiful and relaxing, but more work than I expected. Since my husband is a fish hobbyist there’s lots he knows about keeping all kinds of water critters that I wouldn’t begin to understand. 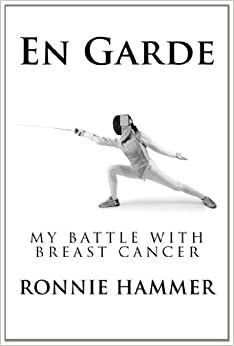 Great post, Ronnie! I know nothing about Koi ponds or Koi, but they are beautiful. How on Earth did you figure out they liked Honey Nut Cheerios? Was it trial and error with other cereals like Rice Krispies? The Shredded Wheat scratched their throats, the Chocolate Rice Krispies made their complexions blotchy and the sugared oat clusters made them hyperactive. What else was left but Honey Nut Cheerios? I wish it were a more exciting story, but the truth is that one of the Koi breeders told us about the Honey Nut Cheerios. I thought it was pretty funny too, but the Koi gobbled them right up. Beautiful! I’ll bet they offer some serenity. Glad you’ve found a way to protect them. I love Great Blue Herons. We have them standing guard by our (retention) pond. But I wouldn’t want them to disturb such beautiful fish. The only heron allowed near our pond is the plastic one that lets the real herons know that this pond is his territory. Better than any other inheritance we’ve ever received!